The best weddings have ceremonies that are romantic and beautiful, and receptions that are all-out parties. Next to food, wedding reception music is perhaps the most important element of making your guests go home saying, "Man, that was a fun wedding." Nothing is worse than an empty dance floor. 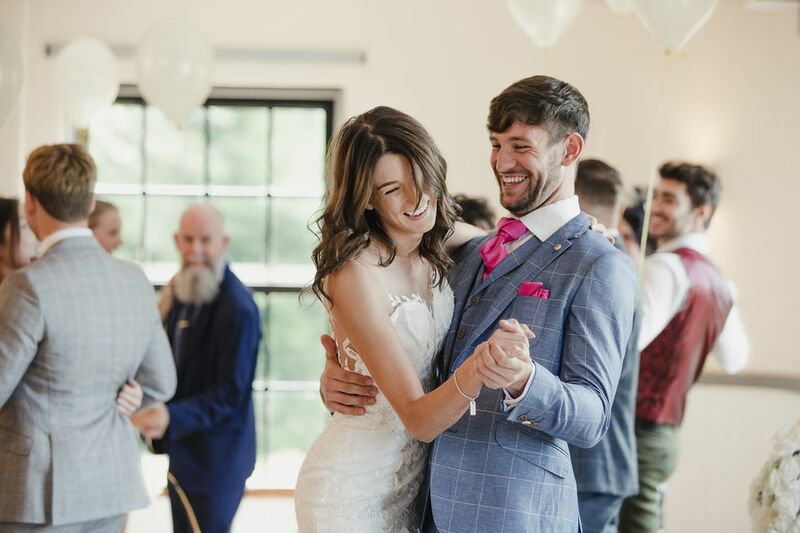 If you want to ensure that your guests are dancing and having fun all night long, here are top tips for great wedding music. In some circles, line dances like "Cha Cha Slide" are hugely popular. In other circles, however, it would go over about as well as a lead balloon. That's why you should place songs you know your crowd will dislike on a personal "Do Not Play List." Bottom line, you know your friends and family better than any DJ or bandleader. If there's a song that will really get your guests dancing, or keep them from dancing, don't hesitate to make that known. On your reply card, ask guests to name a song that will be sure to get them up and dancing. It will help guests get excited about dancing and ensure that the wedding music appeals to a wide variety of people. Check with the DJ or band leader to ask whether and how guests can make their own requests during the reception itself. What appeals to your college friends is not going to be exactly the same as what appeals to your great aunt and uncle, so mix things up and play some of each. If you do it right, the guests who come to the floor for KC & The Sunshine Band will stick around for Beyoncé. Sure, you want your friends to have a good time, but older guests will tend to be among the first to leave, so tailor your music selections accordingly. Towards the beginning of your reception, play '40s, '50s, and '60s hits mixed with current selections. In the last hour, you can stick to current music. Some oldies that appeal to many generations include​ Elvis' "Teddy Bear" and "Hound Dog," the Supremes "You Can't Hurry Love," and Jerry Lee Lewis' "Great Balls of Fire." You can even go further back to timeless classics from crooners like Sinatra, or do a little Charleston to "Boogie Woogie Bugle Boy," which is well known even to younger folks. Traditionally speaking, dancing doesn't start until after the cake is served, but where's the fun in that? Today's brides and grooms want to have livelier, more fun wedding receptions, so they kick off the dancing shortly after the main course is served. In fact, at some wedding receptions, the dancing starts as soon as the bride and groom are announced. Guests are more apt to dance when there are already people dancing, so tell the bridal party that part of their job is to dance and to ask other people to dance. Encourage your bridal party to mix it up and get older dancers out on the floor. The pictures of your 20-something-year-old former roommate dancing with your 80-something-year-old great uncle will be priceless. Even if you have a DJ who will take care of the tunes, spend some time thinking about your wedding music. Put together a do not play list and a list of songs you definitely want to hear. Then throw in some ideas that you think will get your guests on their feet. Give special attention to the song you'll dance to when you first get out on the floor with your new spouse! Billy Idol - "Dancing With Myself"
Earth Wind & Fire - "Shining Star"
John Cougar - "Rockin' In the USA"
Kool & The Gang - "Get Down On It"
Kool & The Gang - "Jungle Boogie"
Michael Jackson - "Don't Stop Till You Get Enough"
Modern English - "Melt With You"
Romantics - "What I Like About You"
The Cure - "Love Cats"
Tommy Tutone - "Jenny (867-5309)"
Grand Funk Railroad - "Some Kind of Wonderful"
KC & The Sunshine Band - "Get Down Tonight"
KC & The Sunshine Band - "Shake Your Booty"
Ramones - "I Wanna Be Sedated"
Rolling Stones - "Miss You"
Sister Sledge - "We Are Family"
The Isley Bros - "It's Your Thing"
Al Green - "Let's Stay Together"
Beatles - "I Saw Her Standing There"
Beatles - "Twist & Shout"
Blues Brothers - "Soul Man"
Creedence Clearwater Revival - "Proud Mary"
Frankie Valli & The Four Seasons - "Oh What A Night"
Mitch Ryder - "Devil With a Blue Dress"
Mitch Ryder - "Good Golly Miss Molly"
Otis Redding - "Hard to Handle"
Rolling Stones - "Jumping Jack Flash"
Supremes - "You Can't Hurry Love"
Van Morrison - "Into the Mystic"
Young Rascals - "Good Lovin'"
Chubby Checker - "The Twist"
Chuck Berry - "Johnny B. Goode"
Contours - "Do You Love Me"
Elvis Presley - "Blue Suede Shoes"
Elvis Presley - "Can't Help Falling In Love"
Elvis Presley - "Teddy Bear"
Sam Cook - "You Send Me"
The Angels - "My Boyfriend's Back"
The Kingsmen - "Louie Louie"
Wilson Picket - "Mustang Sally"
Frank Sinatra - "It Had to Be You"
Frank Sinatra - "The Way You Look Tonight"
What's on Your Wedding Reception Playlist? Should You Host a Day-After-Wedding Brunch? Getting Wedding Pictures Done? Get Your Bridal Portrait Taken!